On June 21st, 2014, I completed my 100 mile ride! Thank you so much for your giving and support! Enjoyed a 3-day, 175 mile ride from Kentucky to Alabama on US BR23! Here is a photo from the ride. I'm continuing to train towards a 100 mile bike ride, and covered 51 today. The day started very cold, but it warmed up and became a beautiful day. The 12 mile up/down in Percy Warner Park was part of our ride so we got lots of climbing practice. And, the traffic seemed thicker this ride, so we had to be extra careful. Next Saturday, many of our team with ride 62 miles. We continued our weekend training, and I biked 48 miles on Saturday, and 30 on Sunday. Don't forget that our Favors of Living event is two weeks away! What goes up 7mph, and down 40 mph? 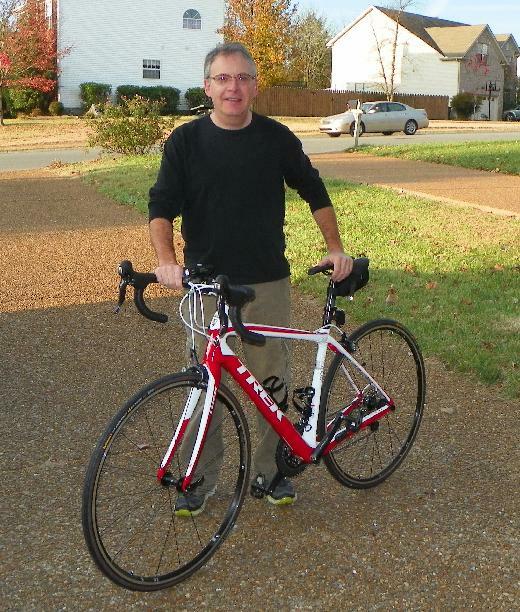 That's me on my bicycle climbing a steep hill in Franklin, TN this morning. And, since this was "Hill Training" I got to climb it 7 times in a row. So, our team is working hard and we ask you to join us in helping cure cancer! On the right side of this page (Make a Donation section), click on the box for "Other" amount. On Saturday, I was the lead bike for the Hot Cholate 15K. We had a 9 degree wind chill, so I was wrapped from head to toe. Fortunately, the lead runner was VERY fast, and I was able to keep a reasonable pace. I climbed hills in a higher gear to generate more heat which helped a bit. The route was really interesting since the police had all of the streets closed. Of course, I guess a run with 5,000 runners needs a lot of room. I'm not used to riding in downtown Nashville and having an entire lane to myself. And, I went through stop lights like they didn't exist. On the return we went down an up ramp (the opposite way) which is something you can't do in a car. As soon as the ride was over, I met up with my other Team in Training friends and we went on a 15 mile post ride. By that time the sun had come out and it was a LITTLE warmer. On Sunday, we met at REI for a bike safety class provided by our coach, Keeley Puncochar. In comparison to Saturday, the weather was WONDERFUL on Sunday, so we went on another training ride. 18 miles later, I was packing up and heading home. Well, if weather underground is right, it's going to be 21 degrees along with a 12 mph wind tomorrow when I'm the lead bike marshall for the Hot Chocolate 15/5K (downtown Nashville). Thus far, my coldest ride was 28 degrees with very little wind. So, it's time to add another layer and drink lots of HOT chocolate! Like the CHAMPION he is, Kevin started back on chemo and was determined to kick this disease again. And that is exactly what he is doing!! Kevin is now in a maintenance chemo phase awaiting the folks at the Sarah Cannon Center Institute in Nashville to find him a bone marrow match, so he can undergo a bone marrow transplant. Kevin will remain in Chattanooga until he gets the call to head up to Nashville. So that is where we are TEAM. I wanted to give you all a little background on this warrior, champion, hero, and person that I feel very blessed to call friend. So keep up the fundraising and training. 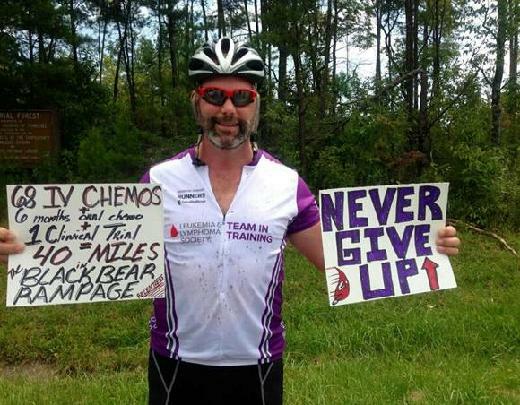 We run, walk, ride, and tri for Kevin and everyone else affected by blood cancers.